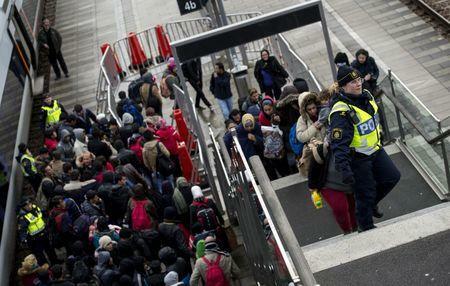 STOCKHOLM (Reuters) - Sweden's state-owned railway operator SJ said on Monday it would halt its passenger services to and from Denmark because it was unable to carry out the identity checks demanded by the government to stem an influx of refugees. Sweden has received 150,000 asylum seekers so far this year, mostly from the Middle East, prompting the government to secure an exemption from the European Union's open-border Schengen agreement and pass a law requiring identity checks on all public transport entering the country. From Jan. 4, transport companies will be fined if they carry passengers into Sweden without photo ID, to the consternation of local businesses as well as transport operators. SJ said in a statement that it did not have the capacity to carry out checks fast enough on passengers, many of them daily commuters, entering Sweden from Denmark across the Oresund bridge, and "chooses to cancel its departures until there is a working solution in place". Oresundstag, the operator of a commuter railway service linking the two countries, said it would remain in operation after Jan. 4 but scale back rush-hour traffic to allow time for the identity checks.